From Sanibel to Marco and everything tasty in between, Restaurant Week is a semi-annual promotion that celebrates dining out at an affordable price. 1. 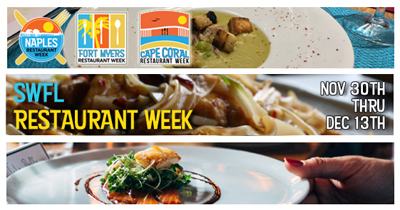 Go to www.SWFLRestaurantWeek.com and pick your city. 2. Look through all the menus and pick a restaurant. 3. Make a reservation. (Not always needed but recommended). 4. When you arrive, order from the special prix fixe menu.